Last spring, I read about The Conscious Cleanse in Colorado’s 5280 magazine. The chief food editor of the magazine wrote about her first hand experience on the cleanse, the good and the bad. This caught my attention. Heck, I even bought the Conscious Cleanse book. Sure, I read it. And didn’t look at it again for a year. In my late highschool and college years, I took great pride in eating healthy/clean, or whatever you want to call it. I flaunted my constructed identity of a health conscious and physically active person. Raw vegan? Tried it. Gluten free? Yeah for a little. While I was loving how easily I fit into my high school skinny jeans, the food lover inside of me was throwing itself on the ground, collapsing into a shrieking pile of sobbing neglect. Butter. Bread. Cheese. Wine. How dare I deny myself the pleasures of God’s gifts to humanity?! Well. The intemperate foodie child inside of me won. For the last year and a half I’ve enjoyed my fair share of culinary school feasts, holiday meals, charcuteries plates and lots and lots of wine. I still made sure I ate my fruits and had salads here and there. But the scales were not balanced. This month I decided it’s time to get back in touch with my healthy side. Last week, I commited to the 14 day cleanse. I re-read the book and totally hyped myself up! Here’s a rough summary of what the cleanse is about: Eliminate common allergy foods like dairy, gluten, night shades, corn, soy caffeine, alcohol etc. for two whole weeks. So what’s left to eat? A LOT of vegetables, fruit, green smoothies, select meats, non gluten grains like buckwheat, quinoa and brown rice, nuts, seeds and more. With all of these delicious foods to choose from, It’s hard to feel deprived! Now im on the last day of the cleanse (I cut it short for Easter weekend, just for posterity) here is what I expierenced. After day 2 I really missed dairy. I wanted yogurt so badly. At day 3 I started craving vegetables and big salads. I thought I’d be dying to dig into a wedge of Brie by now, but im not. Sure, I’m looking forward to treating myself with some cheese and bread, but I’m also happy with my renewed love for green veggies. A cleanse worthy dinner. 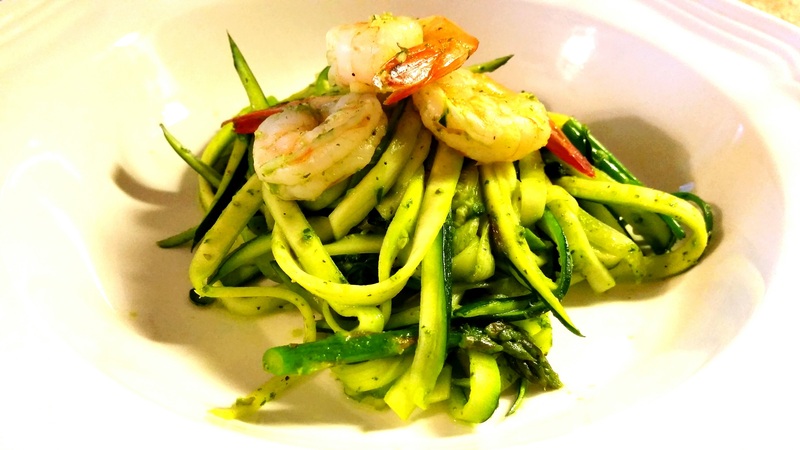 Zuchini “noodles” with sautéed asparagus, baby broccoli and shrimp, tossed in a simple basil pesto. The most important lesson I took away from the cleanse was that I can have the best of both worlds, I just need to keep them more evenly balanced. I also love how the cleanse re-calibrated my taste buds to crave healthy and fresh foods again, especially vegetables. First of all, you are a talented writer! This could be an article in any food magazine. Well done! Next, the photos of the dishes you made are really appealing. Makes the “it’s not so bad” seem true. 🙂 Last, guess I should probably borrow the book and look it over — I know I am not eating enough fruit and veg, either. Thank you Annie! The book is all yours!